Colon cancer is the second deadliest form of the disease in the United States, killing an estimated 50,000 people each year. Now scientists might have found help from a completely unexpected area: a little microbe known as Fusobacterium. Researchers at the Dana-Farber Cancer Institute and the Broad Institute discovered this particular bacterium is present in shockingly high levels in inine colorectal tumors. This is the first time any correlation has been found between this cancer and microorganisms. It's too early to say exactly how Fusobacterium fits in with the cancer - it could conceivably cause the cancer, but there's plenty of other ways that the two might be linked together. "Tumors and their surroundings contain complex mixtures of cancer cells, normal cells, and a variety of microorganisms such as bacteria and viruses. Over the past decade, there has been an increasing focus on the relationship between cancer cells and their 'microenvironment,' specifically on the cell-to-cell interactions that may promote cancer formation and growth. "At this point, we don't know what the connection between Fusobacterium and colon cancer might be. It may be that the bacterium is essential for cancer growth, or that cancer simply provides a hospitable environment for the bacterium. Further research is needed to see what the link is." The next step is to confirm the link by examining a wider range of colon cancer patients to see whether they too have abnormally high levels of Fusobacterium, as well as how those levels compare to those of healthy subjects. The researchers also will attempt to use the bacterium to induce the cancer in animal models to better understand the underlying mechanisms of this strange link. Via Genome Research. 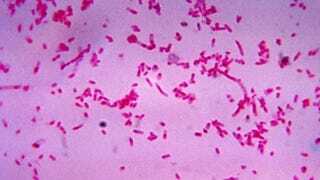 Image of Fusobacterium by the CDC on Wikimedia.